Wearing a blue suit and tie, Najib was calm as he pleaded not guilty in a crowded courtroom to four counts of abusing his power to receive a total of 2.3 billion ringgit ($556 million) from 2011 to 2014. He will also stand trial on 21 other charges of receiving, using and transferring illicit funds linked to the 1MDB state fund. He faces up to 20 years in prison for each count of abusing power under the anti-corruption law, and up to five years for each of the 21 charges under the anti-money laundering act. A defiant Najib, who was detained Wednesday but released on bail after his court appearance, welcomed the chance to clear his name. He repeated his assertion that the money was largely a political donation from Saudi Arabia’s royal family ahead of 2013 national elections and that most was returned shortly after the polls. “I am happy. … Today’s charges will give me the opportunity to clear my name, that I am not a thief,” Najib told reporters. 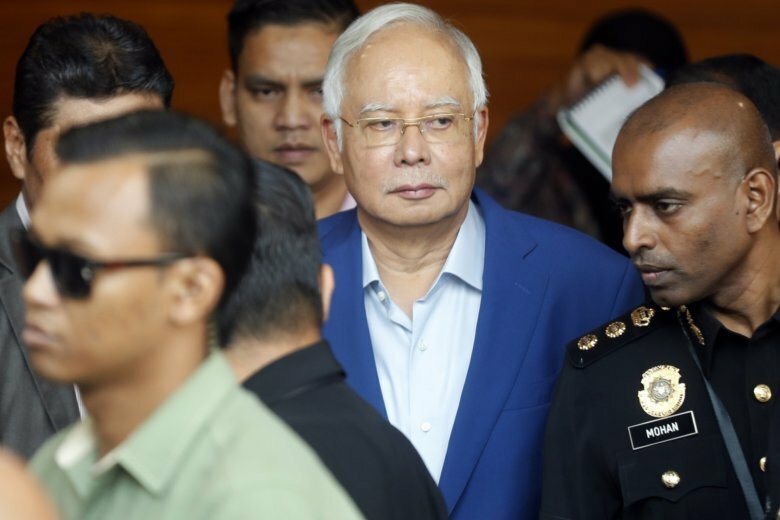 In July and August, Najib was charged with seven counts of criminal breach of trust, corruption and money laundering related to 42 million ringgit ($10.1 million) that went into his bank accounts from a former 1MDB subsidiary. He has pleaded not guilty and his trial is due to start next year. The scandal first broke in 2015 when leaked documents showed that $681 million was transferred into Najib’s bank account, leading to massive street rallies calling on him to resign. Najib fired critics in his government, including a deputy prime minister and the attorney-general, and muzzled the media to try to survive the fallout. A new attorney-general cleared Najib in January 2016. But U.S investigators say Najib’s associates stole and laundered $4.5 billion from the fund, including the money that landed in Najib’s bank accounts. Public anger over the scandal eventually led to the ouster of Najib’s long-ruling coalition in May elections that ushered in the first change of power since Malaysia’s independence from Britain in 1957. The new government reopened investigations stifled under Najib and barred him and his wife from leaving the country. Police also seized jewelry and hundreds of handbags and other valuables estimated at more than 1.1 billion ringgit ($273 million) from properties linked to Najib. Police have said investigations show that $972 million was transferred into Najib’s bank accounts from three companies linked to 1MDB. Najib, 65, has accused Malaysia’s new government under Prime Minister Mahathir Mohamad of seeking political vengeance.